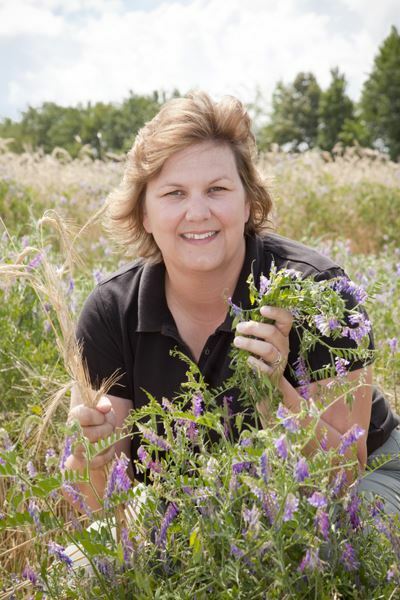 Planning cover crops into your planting decisions can help production efforts, environmental stewardship, moisture and nutrient management and many other issues, according to Dr. Indi Braden from Southeast Missouri State University. Braden spoke at a field day at the David M. Barton Agriculture Research Center recently. Much of Braden’s work is teaching focused on educational purpose. Research is done for the scholarship aspect of the university. However, in addition to that, the university makes an effort to communicate and connect to the community, producers and businesses in the area. “In our efforts into environmental stewardship which we teach in our classes, we instruct students to take care of their soil, for soil erosion potential and water quality improvements. We explain why it’s good to cover your soil, use plants and their roots to anchor the soil and take up nutrients. It only makes sense then that we demonstrate those ideas with plots here at the Ag Research Center,” Braden explained. The university does research in cover crops with the U.S. Department of Agriculture Natural Resources Conservation Service. Research plots included five plots at the farm; crop species planted were cereal rye, annual ryegrass, hairy vetch, oilseed radish, and crimson clover. “Then we also put out plots with perennial ryegrass or barley, so we have several different species,” she said. This builds up organic matter which helps with the water holding capacity of the soil. The root systems help in opening up air spaces not only for earthworms but also for plant growth for next year’s crop. It promotes the build-up of organic matter in the soil. All of that is beneficial. It also preserves soil sediment, so if there is a rain event, runoff is slowed before it actually goes into streams and waterways. That is a big effort that goes a long way in preserving environmental stewardship. Wildlife habitat has improved because of species like the hairy vetch; lovely flowers are blooming, providing nectar for the pollinators that are coming into the area. These are beneficial species. “I can hear and see a bird behind us that’s chirping, so wildlife species are drawn into the area. We have biodiversity that has been increased and improved,” she said. There also is a reduced need for certain species on fungicide and insecticide controls; some cover crops are very important in reducing those costs and inputs. “One of the things we have learned in our five plots here is that oilseed radish can be mixed into a cereal rye or hairy vetch plot,” Braden said. “This plot directly behind me is a hairy vetch plot, it had some oilseed radish and had perennial ryegrass put into it. “We’re actually standing near one of our controls, or checks, where we didn’t plant a cover crop. We’re learning, just as producers do, that you have to plan ahead for the benefits you want from a cover crop. Another thing to consider is timing. Planning a cover crop behind soybeans, since soybeans are harvested later, means you have to consider whether your cover crop will have time to grow. “I’m probably not going to be able to put out something like oilseed radish if I’m following a late October or early November harvest of soybeans because the oilseed radish needs some time to establish before it gets cold,” Braden added. Farmers have to consider what they expect from a cover crop and what difference it will make in yield. “There are some differences in yield from cover crop plots. When do I expect that? One of the things I do know about cover crops is the results are not going to be the very next year. I want to give it a little time. These plants will take some time to decompose in the soil and the slow decomposition is going to take time. It may be two, three years down the road before you see that result. So I have to plan ahead for what my final goals are for my plot,” she said. Weather always has to be considered. Sometimes weather doesn’t cooperate. In 2012 Braden had a plot planted after soybeans. Before the cover crops grew, cold temperatures set in, and it was a really cold winter. Another option is to use a cover crop at the same time your crop is growing. A shade tolerant cover crop similar to a legume, something like a clover would be a lower growing shade tolerant species that you could put under corn. The corn is growing over the top of your legume, which is fixing nitrogen from the soil. That is happening while your crop is actually growing and in place. That cover crop doesn’t need to be removed.